Mr. Kaiser, The public prosecutor’s office in Düsseldorf has searched 13 German branches of Credit Suisse. What do you make of this high-profile action? Fritz Kaiser: Germany urgently needs money, and we already saw in 2008 that it has a taste for the spectacular when it comes to tax. This has become a feature of the German “education” campaign, but unfortunately it can make things very uncomfortable for the clients and banks concerned. Clearly the Germans are copying the Americans. Everyone wants to break down Swiss banking secrecy. It’s not just about a conflict between Germany, the USA and Switzerland. Banking secrecy as a shield for tax evasion is no longer tolerated by the international community. The financial and economic crisis has increased the pressure and is bringing the conflicts to a head. This has led to attacks on Swiss and Liechtenstein banks. Is there still a future for asset management? Yes, with taxed assets. Europe and the USA are ailing, and some countries are even terminally ill. So wealthy people in these places are wondering how they can preserve their assets over the long term for the next generation. This gives Switzerland a huge opportunity. The USA and Europe are heavily in debt, and uncertainty reigns. Wealthy people are being targeted and face fierce criticism because of tax issues. Switzerland is a paradise by comparison. It is politically stable and has its budget under control. It also has a liberal climate, professional banks and acceptable tax rates. Liechtenstein is in a similar position. It’s no wonder that Switzerland’s stock is currently riding so high with foreigners. Even though they can no longer bring untaxed money into Switzerland? The desire for privacy will continue to grow throughout the world. People who pay tax and obey the law should have the right to keep their finances confidential. Banking secrecy can still provide this kind of confidentiality, but exclude tax evasion. A revised banking secrecy regime is still vitally important for Switzerland and Liechtenstein. But if these countries refuse illegal money, it will just go to Panama and Asia. I don’t think that’s likely in the long term. The united debtor nations of Europe and the USA will not allow it anymore. These countries urgently need income and will no longer tolerate wealthy people paying no taxes. Hong Kong and Singapore accept OECD standards, and Panama will not be able to withstand the pressure either. Money – presumably taxed – is already flowing back to Switzerland from such countries. Sounds good. But you’re losing client money too. 3 out of 28 billion francs in 2009. We’ve been adapting to changes in the market since I took responsibility for the group in 2006. We explain the new reality to our clients and point out the risks to them. And we help by offering new solutions. Most clients are grateful for this. Once again: this is leading to outflows of assets under management. We are reducing business that doesn’t suit us. This is a normal process, and one that will continue. Switzerland will inevitably go through a painful period of adjustment over the next few years – as will Liechtenstein and other financial centers that manage money for clients in foreign countries. Fewer assets means lower earnings. Not necessarily. In Liechtenstein we will do better business with fewer clients in future. Our projections tell us that our philosophy will pay off. We have already coped well with the first critical years. An increasing number of prominent figures are joining us, and for good reason. The assets managed by the group’s bank increased by 25 percent in 2009. A client who pays tax is more cost-sensitive and wants better returns. So your margins shrink. There will be pressure on margins because clients are bound to be more cost-sensitive if they don’t enjoy a tax advantage. As a client, you will want the same terms and conditions as in your home country. But at the same time, increasingly excessive regulation is making banks more expensive to run. In Switzerland and Liechtenstein we have to compete internationally. And we should have the self-confidence to master the challenge. People sleep better if they’ve paid their taxes. And you only want to manage taxed money now so you can sleep well. I sleep well because we are continuously doing our homework. Within the industry, people say that you chose this clean money strategy because the USA was turning the screws on you. All banks faced the same risk – and many still do even today. We analyzed the situation properly, identified the risks in good time and took preventative action. We developed acceptable solutions for US clients and are now building up a new business. How will you get rid of the old, untaxed money belonging to many of your clients? By facing the realities and developing forward-looking, sustainable solutions for clients. This requires cooperation between the state and the financial industry. And we have to go to other countries proactively with solutions. In Liechtenstein we found a good solution with the UK. Clients are now willing to sort out their tax status, and the British are getting their tax receipts. The banks and fiduciary institutions have reduced the risk of criminal prosecution; and in the last few months, following the UK agreement, hundreds of new clients have come to Liechtenstein. Do we need an amnesty? Amnesties are often conditional on the money going back to the country that is offering the amnesty. Italy took this route, for example. The clients don’t really want this, though, and nor does Switzerland. Ultimately, Switzerland wants to keep managing the money within its borders. Using well thought-out bilateral agreements, the country can satisfy several interests at once. Would a withholding tax be a good idea? The idea of a withholding tax is an old defensive strategy that may once have been appropriate as an interim solution. I’m afraid that it’s too late now, though. There probably isn’t the required basis of trust in the key countries anyway, and withholding tax doesn’t really solve the problem of legacy issues. We Swiss would have to make deals like the one Liechtenstein made with the UK. But its easer in Liechtenstein, where there’s a prince and a Kaiser. Switzerland has a lot of smart and courageous people, and it is a healthy and trusted private banking island in an ailing Europe. It has everything in place to show real leadership in solving the global problem of untaxed assets. This is a unique chance to highlight the banking center’s qualities. Your asset management group is based in Vaduz. You are praising Switzerland. When are you going to buy a Swiss bank? Switzerland plays an important role in our asset management strategy. We believe in this location for business and we want to become more internationally active from a Swiss base in the years to come. Thanks to its foundations, Liechtenstein will maintain its place internationally. When will you enter the market? We already have a small asset management unit for US clients in Zollikon, and we also run our Responsible Investing competence centre from there. We are always employing people for other markets there too, and we are interested in partnerships with people who think like we do. Buying an asset management institution could also make sense. 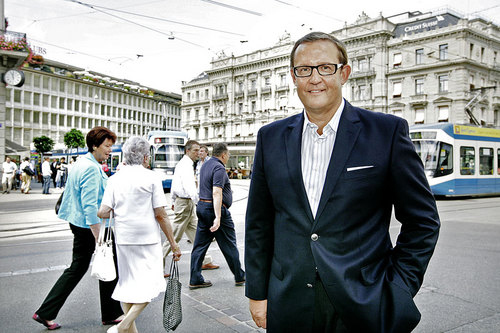 Fritz Kaiser (55) started his career with Präsidialanstalt, the fiduciary company run by Peter Ritter (72) in Vaduz, Liechtenstein. In 2006 he merged his company with Ritter’s. Today he is the majority shareholder and Chairman of the Board of Directors of Kaiser Ritter Partner Group. Before that he was the owner of Diners Club in Switzerland and Liechtenstein, and a co-owner of Formula 1 team Red Bull-Sauber. He is married for the second time and has four children.